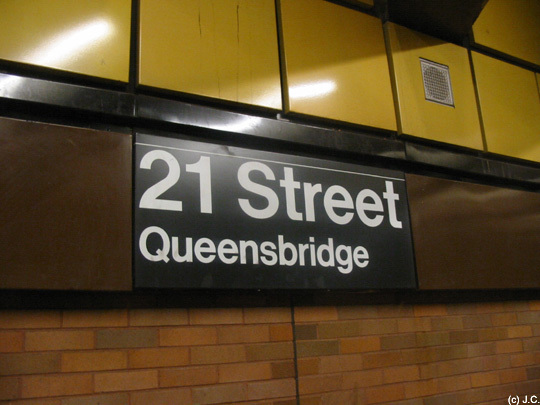 21 Street-Queensbridge is currently just the last or first stop on the F in western Queens. 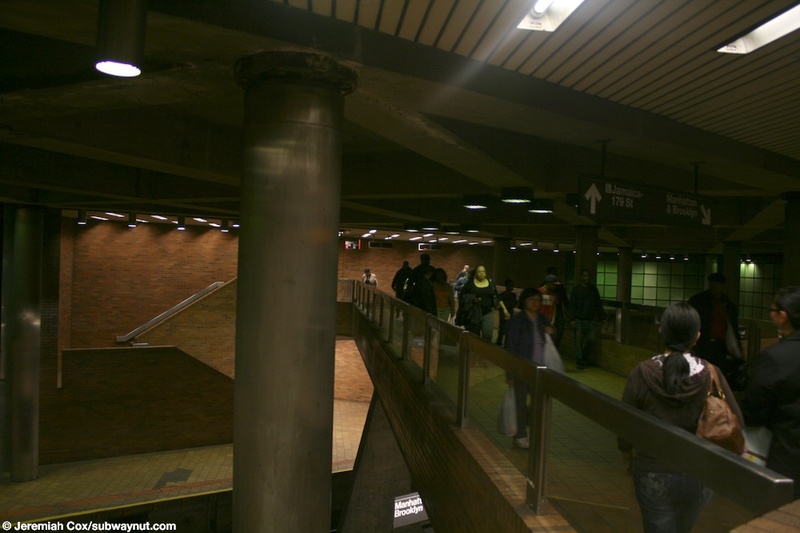 Before the 63 Street Connector opened in 2001, allowing trains to continue beyond the station and reach the Queens Blvd Line, this station was the terminus of the 'tunnel to nowhere' (as it was called when it opened in 1989, ending one stop into Queens, going nowhere else). It was one for twelve years. The station was definitely not designed as a terminal. When the station was one, passengers had to deal with the overpass and there were good signs letting people know what track the next train was running on since the crossover switch is before the station. I still do not understand why the station is not an island platform. 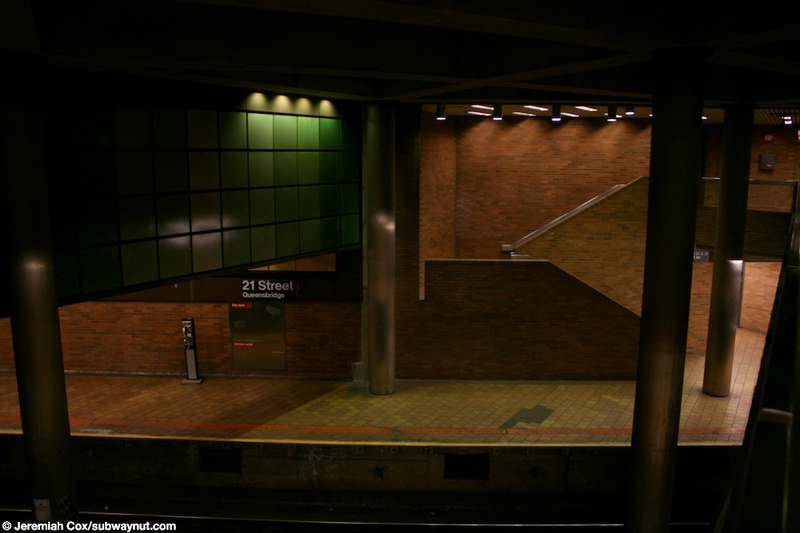 Since 2001 when the 63 Street Connector opened the F train has served the station and there is no reason to see that ever changing. 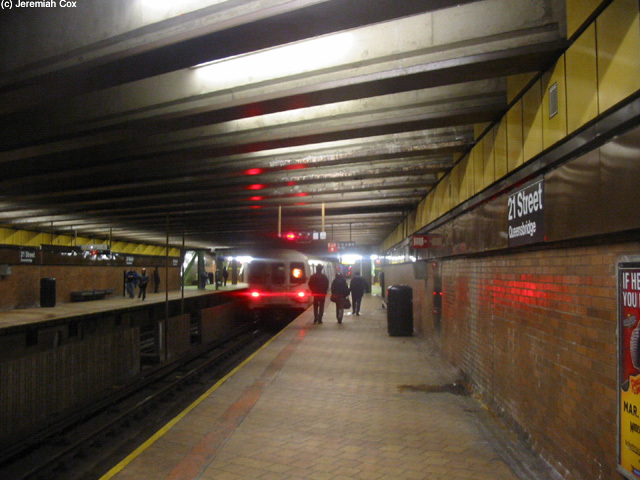 Service through the 63 Street Tunnel and to Queensbridge before 2001 changed a lot over the twelve years since the station opened. For the most part it was as fallows: Q (6th Avenue) during weekday rush hours and middays, B on Evenings and Weekends. 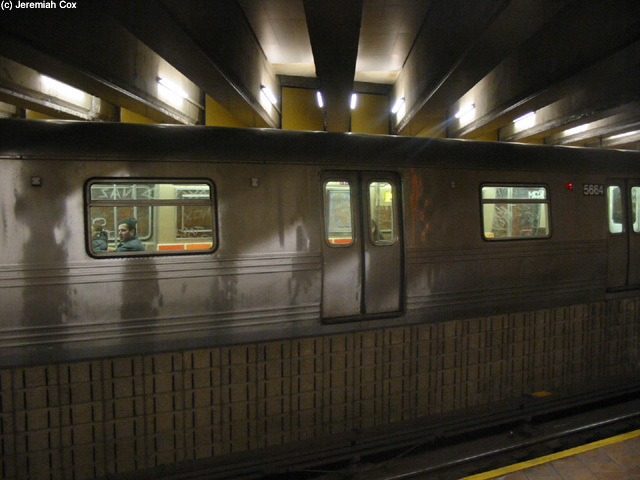 Late Night service was either a special S-63rd Street Shuttle to 2nd Avenue or Broadway-Lafayette (it ran at all times from July to December 2001 since the Manhattan Bridge flip happened first), or the F (the G was extended to 179 Street-Jamaica when that happened). 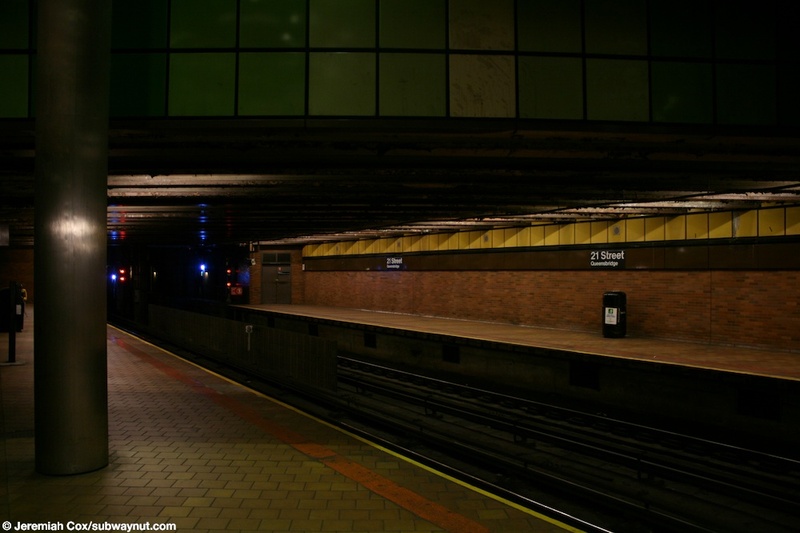 During 1998 and half of 1999 the track bed of the 63 Street line had to be rebuilt (it was a faulty new design) an S shuttle operated every 20 minutes to 57th Street/7th Avenue. 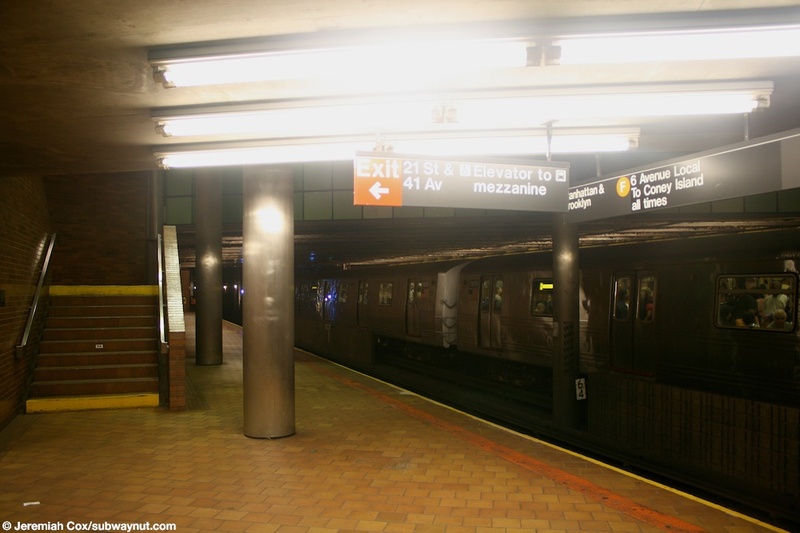 The B and Q terminated at 57th Street/6th Avenue just like the terminal used before the 63 Street Tunnel Opened. The Station since it is so new, has two side platforms, that are decently wide, platform walls as well as the floor are made of brick, towards the top of the platform walls is a line of larger brown sheets, on these are the station signs at regular intervals that say 21 Street-Queensbridge, above this is a thin black strip of metal and above this are yellow squares that take the platform walls up to the station ceiling that is made of concrete. This ceiling is flat, but has a ruffled courtesy of probably steel beams inside the concrete. 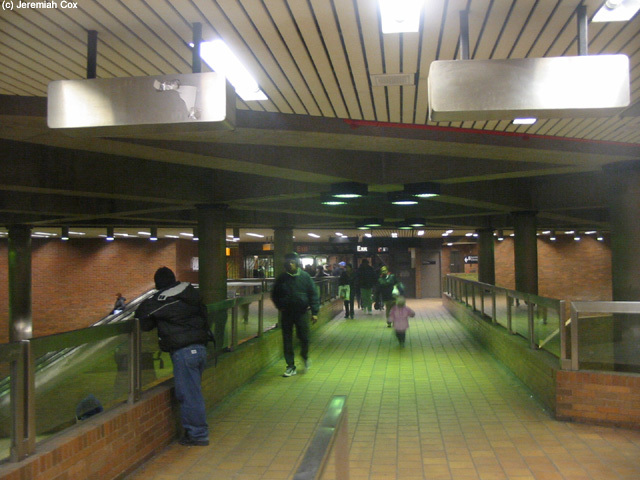 The station's indirect lighting is incorporated in this ceiling. 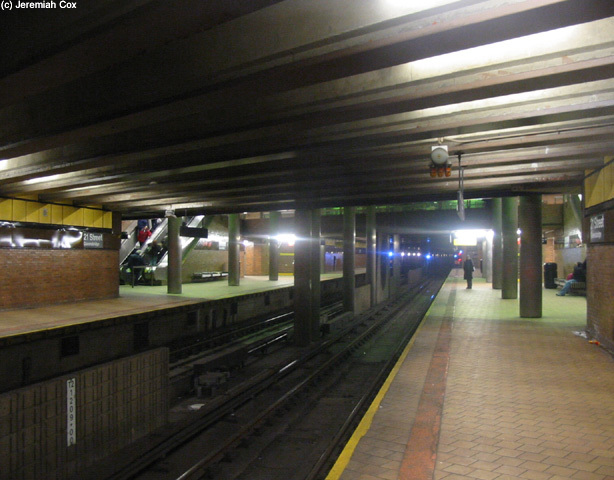 The platforms are columnless. There aren't even any between the tracks. 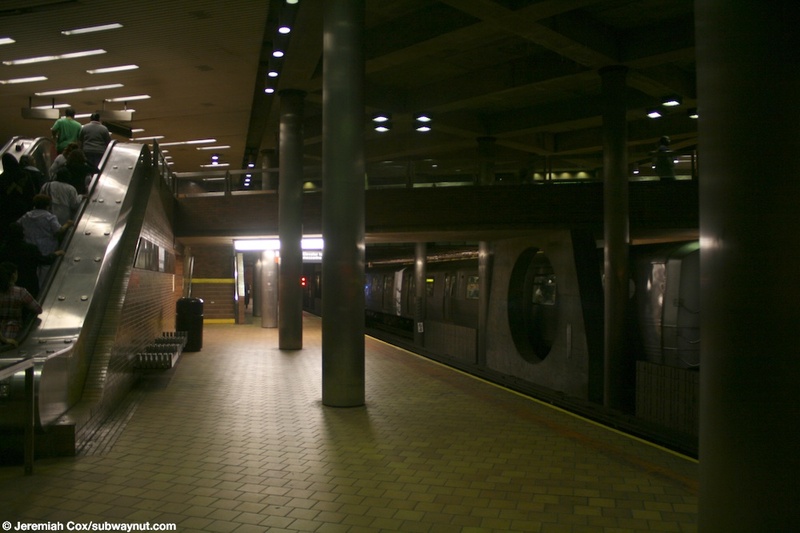 There are only some in the middle of the station when the ceiling becomes double height (This area is almost in the middle of the station but closer to the Eastern end-north, rather than the southern end-south). This is for the bridge across the tracks to the station's exit. 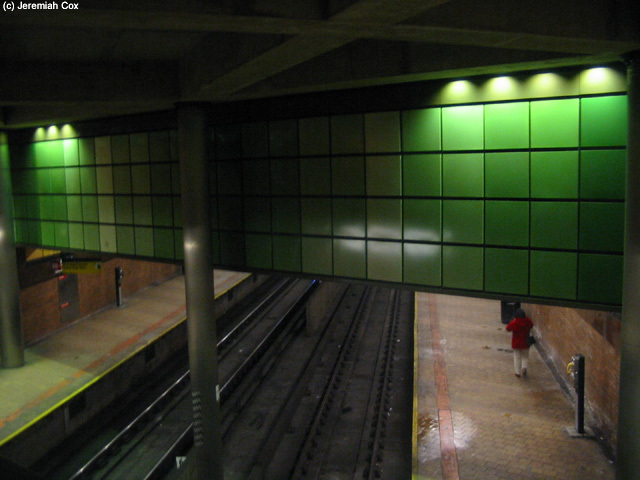 On the walls of the double height portion of the ceiling, when it comes down to normal height above the tracks are decorative green squares that provide some nice color variation to the unusual light-colored brick of the station. There are silver, metal colored round columns here also to hold up the ceiling. This is the location of the stations only exit. From the bridge that provides the overpass and connects the platforms there are separate banks of two escalators (one 'up', one 'down') that lead down to each platform towards their western ends, as well as a staircase towards the eastern ends. Each platform also has its own elevator down from the bridge/overpass area. 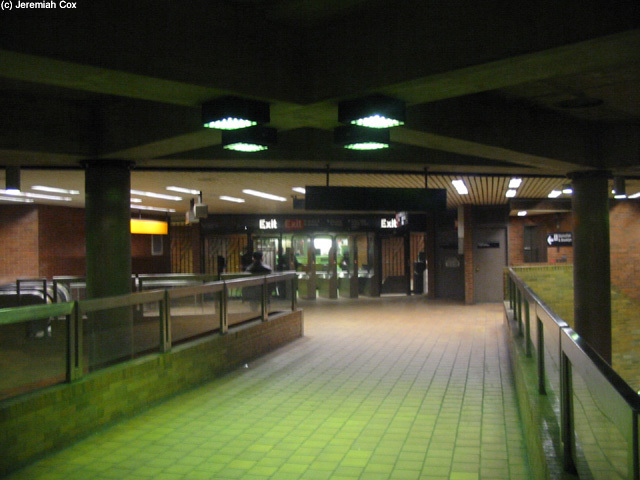 The station's only exit is at the Manhattan-bound end of the bridge, beyond the stairs/escalators/elevator down to that platform is a bank of turnstiles, in front of the token booth that lead to a small area outside of fare control. 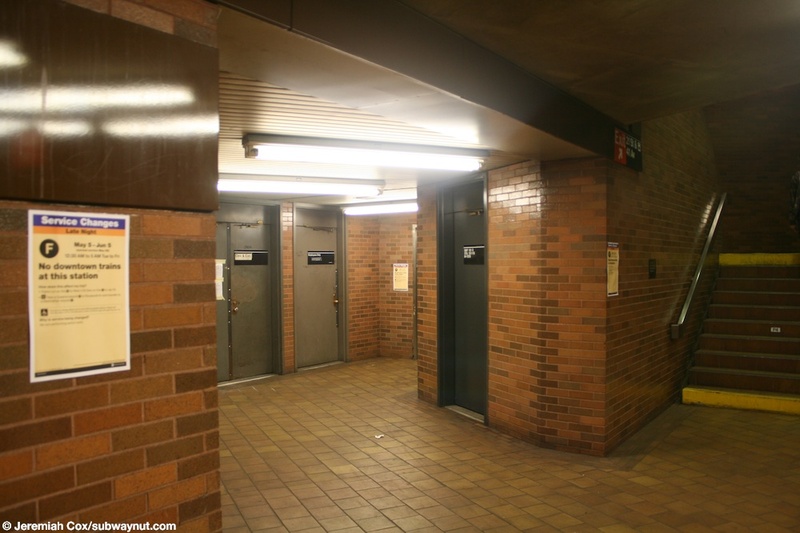 To exit the station there is the street elevator, and a bank of two narrow escalators that lead to the NW corner of 41 Ave and 21 St, right in front of the largest housing project in the city, the Queensbridge Houses. Across 41 Avenue on the NE corner to staircases come up to from the station, one at the corner, and one a bit farther north down 21 Street. 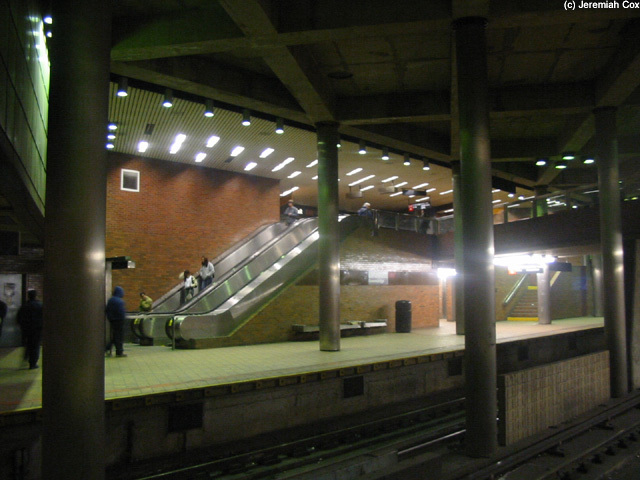 All of the station's four means of entry have bricks surrounding them, with the escalators having a glass roof (held up by metal beams) to protect them a bit from the elements. This street escalator could easily be the most exposed escalator to the elements in the entire subway system. 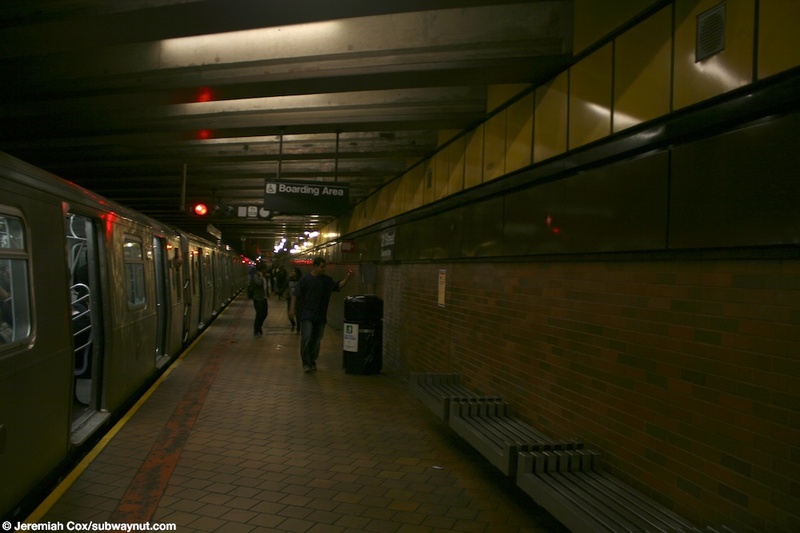 (21_queensbridgef1) Looking down the Jamaica-bound platform at 21 St-Queensbridge as a R46 F train leaves the station. 9 February, 2004 (21_queensbridgef2) A 21 Street-Queensbridge Sign on the Brown stripe above the bricks and beneath the yellow squares along a platform wall. 9 February, 2004 (21_queensbridgef3) Looking across the open tracks at 21 St-Queensbridge as a R46 F train stops in the station, notice the florescent lights in the wavy roof of the platform that help to provide indirect lighting. 9 February, 2004 (21_queensbridgef4) Still in the lower part of the 21 St-Queensbridge Station, the part with the higher ceiling and the station's exit is visible. (21_queensbridgef5) Looking across to the bank of escalators down to the Manhattan-bound platform at 21 St-Queensbridge. 9 February, 2004 (21_queensbridgef6) Looking down the bridge across the tracks at 21 St-Queensbridge towards the turnstiles that lead to the station's only exit. 9 February, 2004 (21_queensbridgef7) The Green squares add a bit of color along the sides of the walls that help the ceiling become a double height above the tracks and platforms. 9 February, 2004 (21_queensbridgef8) Another view down the overpass at 21 St-Queensbridge, approaching the fare control area. (21_queensbridgef9) Looking down the Manhattan-bound platform at 21 St-Queensbridge with a R160 F train stopped in the station. 4 June, 2009 (21_queensbridgef10) Looking down the Manhattan-bound platform at 21 St-Queensbridge, underneath the bridge across to the Jamaica-bound platform as passengers go up the escalator to the stations exit, the staircase up there is in the background. 4 June, 2009 (21_queensbridgef11) The sign for the elevator and the staircase up to the exit from the Manhattan-bound platform at 21 St-Queensbridge. 4 June, 2009 (21_queensbridgef12) The little area on the Manhattan-bound platform at 21 St-Queensbridge that leads to maintenance areas and the elevator up to the mezzanine. 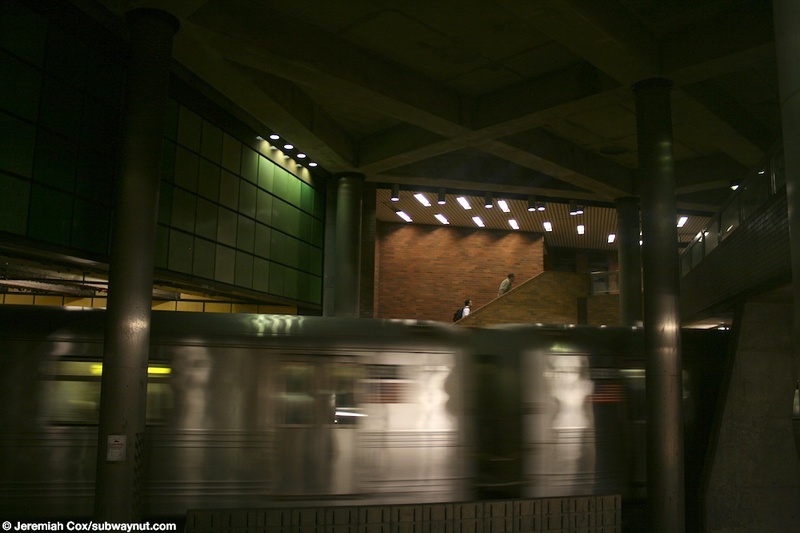 (21_queensbridgef13) The blur of a Jamaica-bound R36 F train in the station at 21 St-Queensbridge as two passengers climb the staircase up to the station's exit. 4 June, 2009 (21_queensbridgef14) Looking across the simple, modern looking columnless eastern end of the 21 St-Queensbridge Station. 4 June, 2009 (21_queensbridgef15) Passengers walk across the bridge to reach Jamaica-bound trains at 21 St-Queensbridge. 4 June, 2009 (21_queensbridgef16) Looking down from the bridge at 21 St-Queensbridge at the only staircase down to the Jamaica-bound platform.